GIVEAWAY and review of City Premier Stroller!! We haven't had a great baby gear giveaway for a really long time around here and I am absolutelythrilled beyond all explanation to be giving away this unbelievably amazing stroller today!!! Because if you know me, you know I ONLY give away things I'd be dying to win myself! First though, a few words about why I love the City Premier. If you've been reading my blog for a long time you KNOW I'm obsessed with the City Select by Baby Jogger. It's ability to morph into a single or double stroller with a total of 16 different possible configurations, the gigantic undercarriage basket, the huge canopy, full recline, and the fact that it pushes like a dream. But I've always been torn when someone asks me about my favorite stroller because the City Mini's one-hand quick fold will change your parenting life! And then, Baby Jogger decided that the City Mini and the City Select needed to have a lovechild. And that lovechild is the City Premier. It combines the love I have for the City Select with the spaciousness, the versatility of baby facing out or facing Mom, the enormous sun shade, the large, lightweight wheels with suspension (my husband is obsessed with stroller suspension ha) that make for a perfect glide, the adjustable handlebar – especially useful for tall parents, and the ability to click a car seat RIGHT into the frame of the stroller (ESSENTIAL with an infant, in my book!!) WITH the love of a one-hand quick fold from the City Mini stroller line. This City Premier stroller is beautiful, versatile, and extremely high-quality. It retails for $429.99. Of course if it goes on sale in the future you know who's gonna find out first (all my email subscribers!!!) but in the meantime, I'm GIVING AWAY one to a very lucky reader! Do you see the AMAZINGNESS happening below?!?!!! One hand quick fold baby. Enter below to win this City Premier Stroller giveaway, and to see ALL our baby favorites and must-haves, go to my best baby registry list ever. Hoping I win this! Thanks for all of your awesome deals and hard work you put in for us readers. Awesome! I have been looking at this stroller! I would love to win this stroller!!! I would love to go to Disneyland again and take my kiddos. I’ve been wanting one of these for so long! Love the giveaway! Oh my heck I would die for this stroller! My husband and I are on a super tight budget, but we don’t want to skimp on the details! I love how smooth it rides, and baby that suspension. Can’t wait to take it to Disneyland and Harry Potter world and EVERYWHERE! What a wonderful giveaway, thank you! This sounds amazing with the one handed fold. This stroller looks amazing! Love your outfit! My fave thing is the quick, one hand fold! The stroller would be our go to for baby #3 due in November! This is amazing! Also, your blog is my fav!! ❤️?? I love everything about, especially the front and back facing option! We would go for a long walk along the beach! I would love to win this stroller because I need something that’s easier to use and fold with two under two! I would probably take this on a walk or to the mall! I love the one hand fold option. Game changer! I would love to win this stroller!! I love your blog! I love your Blog and have followed you for years! What a great giveaway! It would be amazing if I won! Love the city select stroller and love mint arrow! I need this stroller in my life! I am in baby #5 and have never had a nice stroller! I’m dying to win this!! One hand quick fold? Where has this been all my life?!?! Just out of curiousity- do they make double strollers with one hand quick fold? Also, love your booties! OMG!! That looks like a dream! Just saw the giveaway part with the question – if I won, we live in Alaska so this would be great for all our little adventures through fishing towns, and every day use – we also travel a LOT so it would get a lot of love! You always have THE BEST giveaways! Fingers crossed! What an awesome stroller!! Please pick me ? Great giveaway! I would love this! So convenient! This is the stroller I’ve been looking for! that one handed collapse action is like a dream to me! I would love to win this! It would be great for road trips and airplane trips to the grandparents’ house! I love your blog and your giveaways are stuff I actually would use all the time. SO perfect! I’ve been dying to try this line! After 7 years of trying to get pregnant we finally have our baby with us! A good stroller would be fantastic to walk this little miracle around!!! Oh My Goodness! My LO and I would love to win this stroller. Especially with a little brother on the way, mom is going to need all the help she can get as we are adjusting to life with two under two! The one hand fold! Eek! So exciting! Most of our family lives in Utah, so we are making multiple trips a year. How great would this stroller be for traveling?! Thanks so much for all your tips and great finds! I love the versatility and the baby jogger brand <3. It would come with us on our daily strolls to the park. The adjustable handlebars would be amazing! And my husband would love the suspension! I would love love love this stroller! I love the look of this stroller! It is perfect for all those fall walks!! This stroller would save my life!! I got this huge heavy one and thought it was amazing, but nowe I just end up having to use an umbrella stroller because it’s just way to complicated to use on a daily basis! I would love this stroller so much. I’m due in October and this would be the best thing for a new baby. I have rented the city mini double when we go to Disney world and I have bought the select because I can’t give up that easy fold so this would be a dream come true! Thanks for finding all these amazing deals. I’m wondering if this is why they discontinued the beloved City Elite… I’d love to win this! I’ve been checking out the City Select line. Especially because we’ve been thinking about baby number 2! Would love to win this! Been trying for a baby for 5 years and one is one the way!? Yay!!! That looks like an amazing stroller! No way! My wife is 37 weeks pregnant and this would be amazing to win!! We would put it to use immediately! Fingers crossed. I would lovvvveee to win this!!! 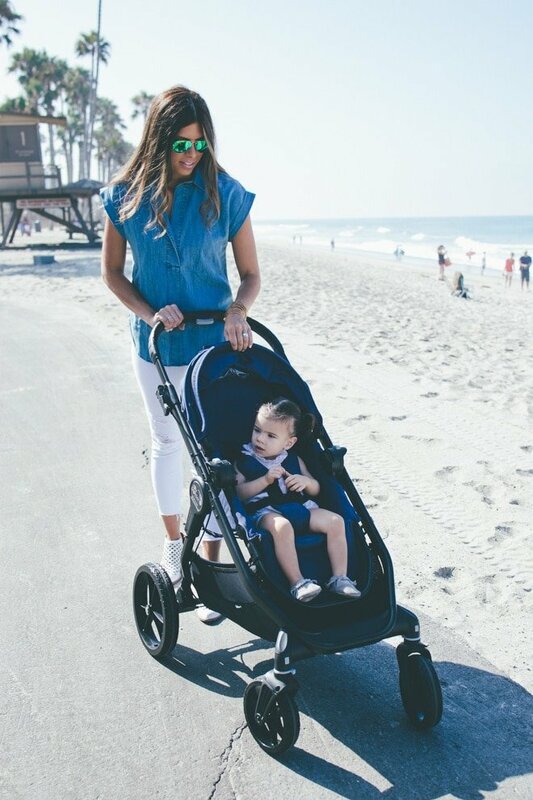 I need this stroller in my life…I also need your outfit and that San Clemete beach view! I lived there for a year in college and LOVED it dearly. Holds a special place in my ❤️! I love your blog!!! Honest reviews and rad products and info! Thanks! Would love love love to win this! Love baby jogger! Oh my goodness.. I TOTALLY WANT THIS!!! I am pregnant with my 4th and desperately need a new stroller. I used my sisters City Select this summer and they really are dreamy!! Oh this looks amazing!! ? This is my dream stiller!!! You are seriously the best Corrine! Keep being awesome! This would be so amazing, I love following you! Thank you!! I would love to win this stroller! I don’t have any money in the budget to buy a new stroller and my old one is over 7 years old. I’ve been wanting to upgrade for our next baby and this seems like the perfect stroller to do that. Love this! Baby #1 due in November, this would be so helpful! This would be amazing to take to Disneyland when we go next year! I love this stroller!! Would be perfect for walking down to our neighborhood farmers market. I’ve been waiting and checking each of your blog posts for a giveaway like this ? I can’t wait!!!! Looks like an amazing stroller! As a soon-to-be new mom, I know this would come in handy going on walks, trips, and more! I absolutely love this buggy! We have owned the city mini GT and the city min GT Double… both awesome. I can’t wait to try this one out. I love this stroller! Such a perfect combo. I NEED this stroller! It looks amazing! How exciting that they combined my two favorite strollers!! Perfect thing with #4 coming in a few weeks! I’m needing to get a new single stroller that’s compact and easy to use while juggling my other 3. Thanks for the chance!! Awesome! Need to trade our old stroller in sooo bad but don’t want to spend the money. ? How fun! What a beautiful stroller! I have a double now for my three and almost one year old, but a single would be GREAT since my son likes to walk and adventure around more and see things up close instead of from a stroller seat. We would go to our local farmers market, and take it on vacations to see my sister and her husband in CA and my brother and his wife in CT. It folds so small, I wouldn’t even be bothered taking this on a plane! 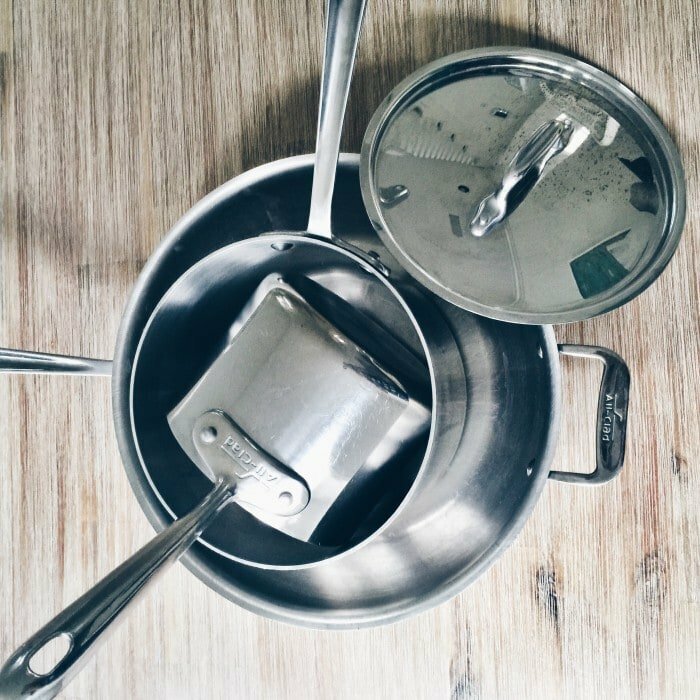 Thanks for introducing me to so many wonderful products that make life easier and more convenient for ALL! This is a dream giveaway!!! I LOVE Baby Jogger! Awesome giveaway! You sold me at one hand quick fold!! Oh man that is so necessary! All strollers should have that as a requirement haha! Such a fun giveaway! Newly Pregnant, this would be wonderful to add to my baby stuff! As a mom of three littles, I would LOVE to have a stroller I could operate (open and close) with one hand?! Goodness, this is genius!! I’d love a stroller that doesn’t require two hands to fold ? Thanks for hosting such wonderful giveaways! I love the one hand fold AND being able to look at mama. I love my cruz, but the easier fold would be fantastic. You giveaways are always great. Here’s to hoping! I love anything baby jogger! Such great strollers! I love that it can face you too! I’ve been looking for a new stroller for my soon to be 1 year old!!! AHHH i need this and have been eyed for so long. Baby 2 coming December and will be a lifesaver with kids being 15 months apart! Looks like an amazing stroller!! Thanks for an awesome contest! Love your blog!!! Great suggestions awesome giveaways!! One hand folding strollers are ESSENTIAL for big city travel! We’d take our stroller downtown! Baby Evelyn needs a new stroller! My husband and I are trying to get pregnant & this would be the most exciting first thing for our first child!! 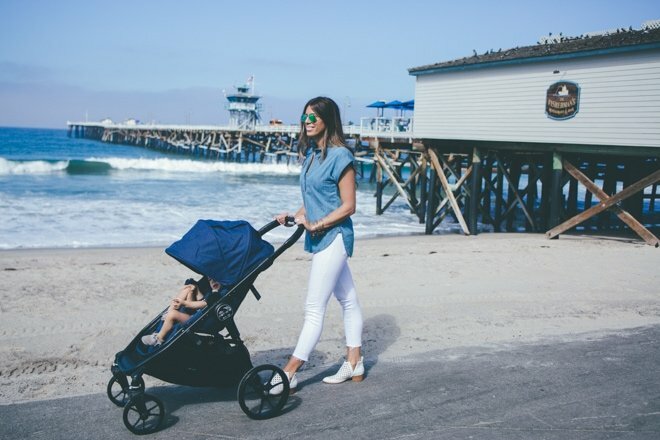 We live in Irvine and would love to take this stroller to walk along the Newport Beach boardwalk!! Looks amazing! I need a new stroller! This stroller would change my life!! Fingers crossed! With baby girl due in just a few weeks, this would be perfect!! Ah how amazing!!! We need a stroller for our first arrival who came a little too early. Looks like another amazing baby jogger brand stroller!! I always recommend the select or mini to every expecting friend! They really have the best strollers. Wow – it’s gorgeous, lightweight and that one handed fold up – I need it! I’ve got a 2 year old and am expecting baby boy #2 in December, so doing things one handed and easily is going to be key for me! Would LOVE to get my hands on this stroller for my little man, looks amazing! I would love this stroller for my new babe. Oh this would be SUCH a dream! I am expecting my first baby in 2 months and would love to own this incredible stroller!!! Thanks for hosting such an amazing giveaway!! This is so great! You’re awesome! This is an awesome giveaway! I’d be super excited if I won. I’ve only had hand-me-down strollers so this would be a nice treat. Thanks for hosting such a great giveaway! I love that its light weight and easy to fold away. I would take my toddler to Disneyland once and for all. I haven’t taken him because we donated his stroller to a mother in need. So lately hes been walking and I’m so proud of how much walking he has done. At the same time when hes tired mommy ends up carrying him. Would love to win I like that it looks so easy to fold and I would use it everywhere all the time. Love this comp and always enjoy your blogs. I love the one handed close, and easy glide, and the cute look. I would use it everywhere!! ? Loveee! My sister has this stroller and loves it. I WANT!!!!!! ? We could really use this stroller for baby #2!! I’m prego and would love this! That stroller looks AMAZING!! Easy folding is so key. This stroller seriously looks amazing and I would love, LOVE to own it. I would love to win this stroller! City jogger strollers are the best!! After a long journey of infertility I would love this stroller for our new baby! This would definitely make traveling into NYC a breeze! Love this stroller! We were thinking of investing in a double for when our 2.0 gets here in a few months but I’d much rather have something light and easy! Having a baby in Jan! This stroller would be perfect! I love the 1 hand fold function!! That would be so handy especially living in a 2nd floor apartment! 🙂 My husband would definitely love the suspension! I would use this to go on walks every morning with my IVF miracle baby ??! This is the best giveaway ever!! I have a 16-month-old and am 4 months pregnant with our second baby, and would love to have a compatible, lightweight stroller for going to the park, shopping, and trips to the city! I need this! It really is a lovechild! haha! Thanks for always keeping us up to date on baby deals! I would have been completely lost without your baby registry! My wife just broke the news to me this weekend that our first baby is on its way! So excited! Would love to have this stroller for our first! This stroller sounds amazing! I’ve seen them around and have always wanted to try one! I love my city mini but would love to have my baby face me! Love this new stroller! Would definitely take it traveling around Europe! I would absolutely love love to win this stroller! Thanks so much for the chance to win it 🙂 looks so amazing! Love that it has one hand fold and a couple of seating positions! I’d probably take it to Disneyland! I always have a stroller with me in the car. You never know when you will need it. This stroller looks so comfy. I know my little girl would LOVE it! Oh and my favorite part…one hand quick fold! Can’t go wrong with that when you’re a mommy. You ALWAYS need and extra hand! I love that it is more compact and the one handed close?? Seriously!? It’s what stroller dreams are made of. I’d definitely love to take it on an evening walk on bountiful boulevard! Love the easy fold! I would take this baby everywhere! This stroller looks awesome! I would take it everywhere! But it looks especially awesome for airplane trips because of the one hand fold and full recline! The one hand folding feature is awesome! Would take baby from beach to shopping with grandma in the city premier! oh man I would love to win this!! This looks amazing! I love that one handed fold. 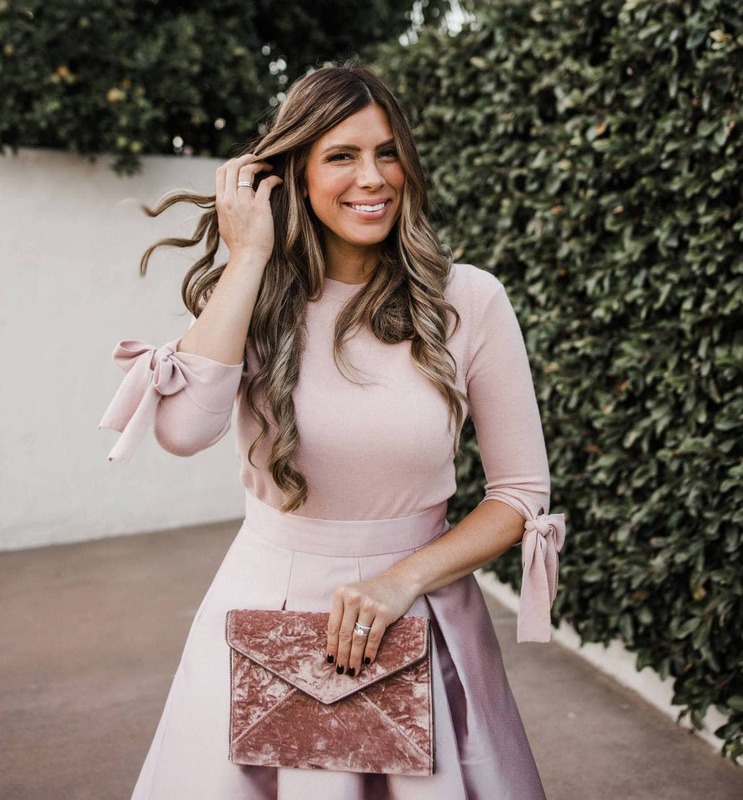 Love your blog and insta! Looking for a new stroller..this would be great! I would love to win this stroller! Finally having baby #3 after 8 years! This stroller looks amazing!! I love how you perfectly described the benefits of the two other models that make this stroller the BEST option. Thank you for your amazing eye for detail and your love of sharing these deals with your followers 🙂 I would love to win this stroller and take it EVERYWHERE! Seems so versatile! Thank you for finding such great finds. Oh! I love this! Would love to win! Thank you for the chance. I saw this stroller not to long ago and fell in love with home easy it is to close and the space it takes up. What’s not to love about this stroller?? I think the suspension might be at the top of the list, but the storage and quick fold! ? We live close to Liberty Park in SLC and though it’s close to home and not a fancy destination we would love this ride to get us to and from. This looks like the replacement for the city versa. We love ours!!! I was leaning towards the City Select for our first baby. Now, I think I’ll definitely get the Premiere! I hope to win! Ugh I need an easy folding stroller. I walk my baby to daycare every day and should be strollin. I’ve been eyeing this stroller. Great giveaway! I would use it on the go with my baby that’s soon to be here in November. I love baby jogger. I have the double summit x3 and i love it! This would be amazing! Thanks for always finding the best baby gear! As a busy mama…I would love this. The one hand fold is probably the best feature. This would be AMAZING to travel with!!!! I would Loooooovvvveeee to win this gorgeous stroller ? I would love this stroller! It’s perfect for folding up quickly and love all the different positions! I would love to win this stroller, I need a stroller so much thanks , thanks for the opportunity! Awesome giveaway!! Love this stroller!! This stroller looks amazing! How fun would this be for Disneyland!! This stroller looks amazing, I would take it everywhere!!! It would be so perfect for my 7 month old, her current stroller is on its last leg haha! I love the one hand close and open option, and I love the versatility options when it comes to seating arrangements. I’m not sure I would go anywhere without it! But probably my favorite place to take it would be DISNEYLAND! This looks like a dream!!! Yay! What a fun giveaway! Love your blog! Baby #3 would LOVE a new ride! I’m a fan of anything EASY to use! I would LOVE this stroller!! Oh my gosh!! I would lOVE LOVE LOVE to win this stroller!! Thank you so much for offering this fabulous giveaway! I would love to have this stroller! It would give us the freedom to go hiking on the trails at Mt Charleston-with the suspension our new little girl won’t get tossed around! We can enjoy time out without worrying about her comfort! Oh man, this would be a huge blessing! Would love to travel with this! Love the one handed fold. I have the city select and it is a bit cumbersome to fold and load in the car. You are the best! Love your blog! Thank you! Ah! This stroller sounds perfect! Thanks for the give away! I would die! I was just looking at the mini! I would love this so much! Our stroller is on its last leg I’m afraid! Thanks for all your awesome posts! I’m due in December and would love this! One handed fold and more storage than the mini! I”m sold on the one handed fold up! Expecting our first baby in December and would LOVE this stroller! I need a DISNEYLAND stroller and this one would be uh-mazing! ? I love how the stroller is one hand fold up! Definitely would have to take my babes out to the park! I absolutely love that it has the City Select features for one! Thanks for the giveaway! I love this stroller! The one hand quick fold is pretty impressive—and I know it would come in handy with a toddler and infant in tow! We are also suspension people so the fact that the Premier boasts great suspension is a plus! And I don’t know how I ever missed the adjustable handle bars when I was looking for strollers for my first born but that is awesome! My husband is 6’1 and I am 5’3 so the adjustable bar would be a dream! We would stroll everywhere with the Premier! I NEED this for all of our Disneyland trips!!! Thank you for ALWAYS being so classy, stylish and showing us the best products!! What an incredible giveaway! So generous! Baby #5 is coming and all of my baby gear is 10+ years old so we are giving away what we can to those who could use it and trying to budget for newer. This stroller is beyond my dreams but would be so wonderful! I would love to take it to Disney Land with our kids next summer and of course all the daily strolls to parks for aoccer practices too! ? This stroller is a dream!! I would love to win! This would be amazing!!!!! I have friends that swear by this brand for their strollers for their quality and style. I got the city mini based on your rec and we love it! It would be so awesome to win this and use for our next baby — I love the click in feature for the car seat! I would love to win this stroller!! It looks amazing! What an awesome giveaway! I already love Baby Jogger, but this new stroller looks amazing! What an awesome stroller! I love the adjustable handlebar – my husband is over a foot taller than me so this would be perfect! Does this have an option to become a double stroller?? I mean, I think that would just take the cake with all of the included features. Love Baby Jogger and would love to try out this new product with my next little one (coming soon)! I would love this for my one year old! Stop it!! This sounds absolutely amazing. I need this! You’re awesome for doing a giveaway! Yay! P.S. I got the travel light crib on Amazon prime day thanks to you, and I absolutely love it!!! This stroller looks amazing!!! I need this for baby on the way. This is such an awesome giveaway! I love love LOVE the one handed fold! It would be especially useful with my little mama’s boy who wants me to hold him all the time! We’d love to take it to Disneyland, the beach, you name it! Such a great stroller and fabulous opportunity! Always love your giveaways and would especially love to win this one! I LOVE my City Select and got it because of your review and posting the sales! I’m so excited about this new one now too! Hope we win! Love the blog. Need this stroller in my life! Love your blog! Great giveaway! Looks like an amazing stroller! I must have this!!! My stroller is completely trashed and I have a new baby on the way! We are in residency without anything extra so this would be a dream! Pick me! Pick me! Haha but seriously this would be so great to win! I have been eyeing this stroller for a while now! Thanks for the giveaway!!! ? This sounds like the perfect stroller. We would love to take it when we travel to see family and just walking around the mall! Oh I hope I win this!!! Would love this for an up coming trip to disneyland! I love love love the fact I can face my son in towards me! This would be so fun to win! You are so fun to follow! 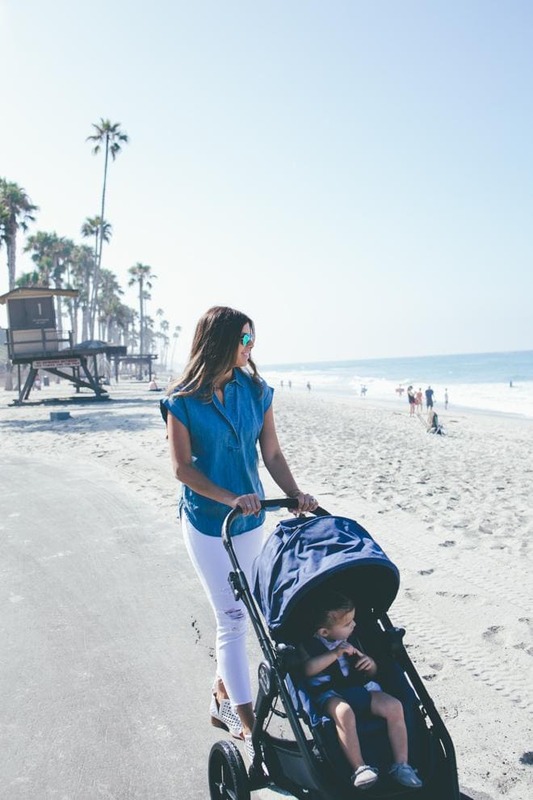 I love how you explained every new little detail that the stroller brings and how versatile it is for a mom on the go no matter where the destination is. Thank you so much for this wonderful opportunity. Yes please from this new mommy! This stroller looks amazing! I love my city mini, this would give me the extra needed room! That stroller looks amazing! Would love one for my little girl! Crossing my fingers and praying really hard!!! Thank you for the awesome giveaway! Having my 3rd baby in September and this stroller is looking ideal for a busy mom like me! Love how easy it is fold up! Amazing! I actually wouldn’t take it any where, I’d give it to one of my younger sisters. I’m done having kids and my baby is 5, but they would get lots of good use out of it I’m sure going on walks around the neighborhood. I like that it’s forward facing of rear facing for younger babes ? I would take this on our daily walks and any city shopping trips! Love the one hand fold! Essential with a baby! Would love to win! Just found out I’m pregnant and have read all of your stroller reviews! Thank you for this opportunity to win. Looks like an amazing stroller! Oooh! I’m so in love with this stroller! It’s literally everything I need combined into one. ??? I need this! I just had my 5th baby, she is a premie and still in the NICU. I’d love her to have a new, clean and super easy stroller instead of old hand me downs! Oh man, where wouldn’t I go. I think I would walk more if I had this stroller. Just had baby boy number 4 and it would be so nice to have new stroller instead of making it work with what we have. Thank you for doing this. We have a 3 year old and 7 month old. We are taking a trip to Disneyland in November for our oldest’s 4th birthday! Thanks for doing this giveaway, I know whoever wins it will be so grateful. This stroller looks amazing! I love the fold! Thanks for the giveaway I’ve been shopping for a double since finding out we’ll have two under two!! I love baby jogger!!! Expecting our first little on in October! So excited for this giveaway! I am having my first child in January! And being a college student but still liking nice things, this is perfect! I have narrowed down my stroller choices with one being the city select. but I hadn’t seen the premier yet! So thank you for the great review and now I’m convinced! We are going to DC next month and this would be perfect to take since we currently only have a bulky jogging stroller. I love the sleek design. This is the perfect combo with the big wheels that will go over anything, but also light weight and easy to tuck away. I love this!! This would be so fantastic! Good luck everyone! this stroller looks amazing!! fingers crossed 🙂 Thank you!!!!!!!!!!!! Haha I LOLd at your line about the love child. This is such a cool stroller! I love all the configurations and easy fold up- that is crucial! I love baby jogger anything!!! Looks so convenient to use! My hubby and I will be trying to get pregnant here really soon and would DIE for this stroller! Our first adventure would definitely be the place we fell in love–DISNEYLAND! Awesome giveaway, thanks Corrine! I would seriously love to win this stroller! Crossing my fingers! what a wonderful giveaway!! Thank you for always posting amazing products on your blog. I would die. This stroller is amazing! Love this stroller! have a friend pregnant with a surprise baby #5, I’d love to win this stroller for her xoxo! This is an awesome stroller. this would be a life saver!!! What a great giveaway! I also love the City Select, but the Premiere looks amazing for strolling the kiddos around too! I would love to win the stroller! By the way I love the name Lyla — it’s my favorite great aunt’s name. Winning this stroller would make life so much easier with the second baby. I’d take this stroller everywhere! One handed fold ? Would love to take this out around the city! Thanks for the opportunity to win this stroller! Love your blog, it’s the best.? I love how you can have the seat forward or rear facing and it’s easy to open and close! I’d love to have this for our baby girl, due in just about 7 weeks! This stroller is awesome! Thanks for the review and the giveaway! This would be AMAZING for me to win, my husband and I are BOTH full time students and he’s going to be going to med school within the next couple of years and so this would take a HUGE load off if we won! Oooohhh i need this stroller in my life!!!! I’m due in October! I would love the opportunity to win this! Thank you! In need of a jogger stroller and would love to win! Thanks for the awesome giveaway!! Love everything about this stroller. Does it have the option to turn into a double stroller?? I love following your blog! And would love to win this stroller!! I don’t know if the one-handed fold or the amazing stroller suspension is what sold me, but I do know that I’d probably be going on a lot more walks if I had this dream of a stroller! ? I loved using a City Mini and have heard only amazing things about the City Select, definitely going to have to check out the hybrid of both! Thanks so much for the opportunity to win one! ? What a fabulous giveaway and I would love, love, love this stroller!! What a generous giveaway! We have the city mini and love it, but this looks amazing for number 2! Oh my goodness how this would be a game changer for me! I have two active little people, four and almost three, and my little babe. I would go shopping or to the zoo or just anyplace I’m not going now! Ha! Love this giveaway and hoping I get lucky today! Oh how would love some luck! I love following your blog you have the best deals ever! I would die if I won this stroller! Yes, please! That would be perfect for my little man! Such a baby jogger fan, but can we talk about your gorg outfit some more? would absolutely LOVE this stroller! I already have the City Lite Stroller for my grand kids and love it!! I purchased from your recommendation, thanks!! I would love to have this updated and more versatile one!! I LOVE LOVE LOVE You for doing this Giveaway!!! You are the Best! Crossing my fingers and toes!! I would love this because it sounds like a wonderful stroller. We would travel all over the states with it while my husband interviews for residency! I would LOVE the extra space this provides. We’ve talked about getting a zoo pass for my daughter’s first birthday coming up in October. This would be perfect for that! I would die to finally have a nice stroller after 5 kids! This would be a dream prize for this expecting mama! This stroller seems perfect! I love that its lightweight, and easy to push around. The fact that a carseat can attach is a huge bonus! My baby is 3 months old and I love how convenient it is to get her out of the car and right into the stroller. This city premier looks a lot easier to fold up and put away than her current stroller. We use our stroller all the time! We all love going on family walks in the evenings and I love having a stroller to run errands. My baby girl would love this stroller! Would love to have this stroller!! We love to go to Disneyland and this would make visits with just me and the babe SO MUCH EASIER!! No more stress about getting into the tram! Love your Chambray shirt! Classic and gorgeous. 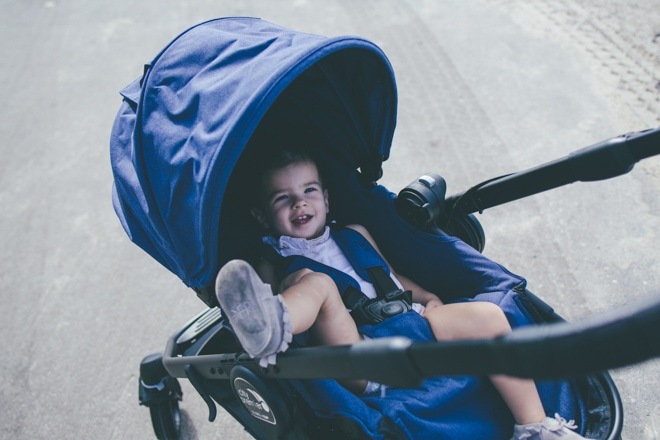 We love the baby jogger brand, this stroller is very similar to the Versa. I have always wanted it! The city premiere looks just as great, I would love to have my little guy facing my while pushing him in the stroller!!??? This is an amazing giveaway! I love baby jogger’s city mini GT stroller. But this one just has the best of both the strollers I love!! 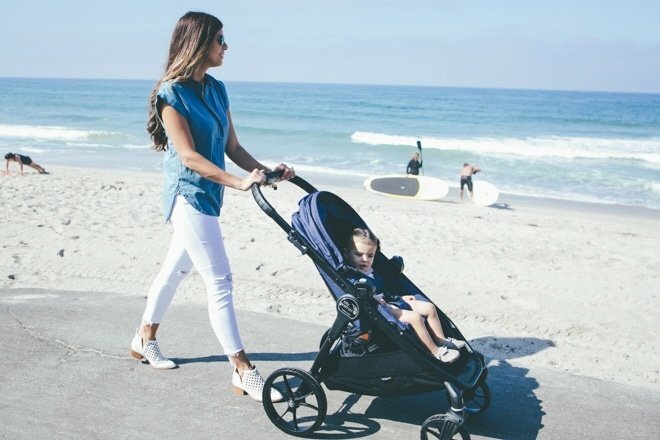 We love the baby jogger brand, this stroller is very similar to the Versa. I have always wanted it! The city premiere looks just as great, I would love to have my little guy facing me while pushing him in the stroller ??? This is an amazing deal! Would love one of these for my little guy! Stroller looks amazing! love the one handed fold up and load into the car! I’m due in January, and this stroller, especially with the one hand quick fold feature, would be a life saver! Such a great giveaway! I have always wanted one of these strollers and this one looks top notch! I would take it EVERYWHERE! Baby boy loves to go everywhere with me and this looks like the most perfect ride! In love with this stroller! I’m due with my first baby January 3rd and there is so. much. to. buy. This would be a dream! I am expecting my second in March! I would love this! Thank you for this awesome giveaway! We’ve got a baby girl coming in December and winning this stroller would be a dream! I love my city select but would die to get this one!!! This looks like a great stroller! Would love to try it out! I would love to win this!!! I love my city select but it is so heavy and tricky to get in the car. I would love this! I love my mini, but have two kiddos now! You find the most amazing deals! Loyal follower. Love ALL of your recommendations! I love that this stroller has an adjustable handlebar, my husband is about a foot taller than me so we struggle finding things like this that work comfortably for both of us. That one handed fold!!!! I would die if I won this!!!! This stroller is amazing! A one handed fold?! I like how I am entering this giveaway in hopes that I actually win. If I do win I would take the stroller, to the beach, to the mall, on vacation, heck I would take it everywhere, since its that easy to fold! I love that it is easy to fold up and the size of the stroller. I would go to the park or downtown. This would be amazing to have! Thanks for the amazing giveaway! This is so great- your blog, the pictures, this giveaway! My love for baby jogger runs deep! Expecting my first thus December and have been loving the baby jogger line! What!?! This sounds amazing! I would me making a lot more travel plans if I had this!!! Fingers crossed!!! Love your blog! ? We would take this everywhere. With fall fast approaching, the apple orchard, pumpkin patch especially. Love the front & back facing option , sometimes my baby wants to look ateverything & sometimes he’s sleeping and i want to see his sweet face! 🙂 Would use it around our home for walks & in our first disney trip happening soon 🙂 Thanks! This is a great stroller! I’ve been doing some research and this one has so many points in its favor. Love that you can turn the seat around and the compact fold!! Best stroller simply for the one handed fold down! I would go all over town with this stroller! With a new baby and a 3.5 year old, we just don’t sit still and it is too hot in the south to baby wear outaide! Yay! Love this! Purchased the citi mini (per your recommendation) for my first child! I would love this stroller! I am due in November! This stroller looks like a dream!! I would love to win it!! ? I love that this stroller has the ability to click a car seat into the frame of the stroller. I also love the adjustable handbar. This stroller is super cute. I was testing it out in Babies R Us. I would LOVE to win this! I bought the city mini when you posted a sale about it and I love it but I would to try this one out with the two way facing seat!! Crossing my fingers so hard! This would be amazing! I just found out I’m due in January! This would be a great check off the list with the little amount of time we have! I am pregnant with #3, and my stroller I currently have is old and very used! It would be so nice to have this new amazing stroller!! Please pick me! I would absolutely love this stroller. It would be a dream to be able to open and close it one-handed! I also like that it seems pretty compact. And the suspension and height adjustment would be a huge draw for my husband. I would take my 10 month old everywhere in it! 🙂 I hope I win! This stroller is AMAZING! I would be so so excited if I won! I would love this for my girls! I love the style of it. I like how you can change the handle direction and the easy fold. I want it. This would be amazzzzzzing! Fingers crossed!! Ahhh! This is my DREAM stroller! I was pushing my friends baby in the City Mini GT this morning and thought to myself, if this stroller allowed the baby to face me and had a bigger basket it would be perfect! And then I found your post about the PERFECT stroller. I would love love this for my baby boy due in November! This would be so amazing to win! I can’t believe you can fold it with one hand! That would help so much with my 3 little ones! I love how versatile the stroller is!! The one handed fold would be life changing! If I won i would be so excited to take it to Disneyland!!! I love baby jogger strollers so much. I couldn’t quite find enough money in our budget for one but I would love to win this one. so great! This looks ten times easier to fold up than the City Select!! So excited for this! It’s my dream strolled! Oh how I needs new stroller! Ours is 3.5 years old and has been through the wringer traveling internationally and on many runs. Our newborn (and myself) would love a new stroller, especially one as nice as this! I’m due in december with #2 and have heard you say some many positive things about this stroller! I’m pregnant with my first and this would be awesome to have! My husband and I are both tall so the extension is a must!! Ahhhh! I’ve resisted buying the City Select because it didn’t have the one handed fold that I LOVE on my City Mini! This is officially the PERFECT stroller!! I’m sure hubs won’t let me buy yet another $400+ stroller so I need to win this thing!! I need more compact and easy to fold things in my life! Yes. I wish I had bought a City Select instead of my Britax! Had I know…strollers really are an investment & I need all the room in my car trunk that I can get! Oh this would be so amazing!?? I love the one hand fold feature! Of course I love my City Select double, but this would be amazing for on the go when I just have my younger daughter with me! What an amazing giveaway! Loving this ? I would love this stroller. Omg! I would love to win! Being a mom of two girls, one almost 3 and one 4 months old, I NEED this stroller to make traveling so much easier! I absolutely love this stroller! Such a great review. With my three year old and a little girl due in November, this easy fold and sweet design would be a dream! I would love to win this stroller! I need something that is easy to push on the old sidewalks in my neighborhood. I would love this! Everything Im looking for. How awesome is this?! I’ve been dreaming of this stroller, it looks absolutely perfect! One handed fold!!! i love it already! Oh I would love this! This stroller looks amazing! This is brilliant! I am so excited to hear about this new Baby Jogger lovechild. I love love their strollers and would LOVE to win this one! Thanks for the opportunity! This stroller looks amazing! I love its sleek design and how easy it is to fold up on your own. I would take this this everywhere! Such a beautiful stroller!! Would love to take my toddler on walks to the park now that my oldest is in school! Oh please oh please, pick me! I have a miracle baby coming in March and with my two order kids being 4 and 8, I am in desperate need of an uogade on the stroller front. I’ve never had a new stroller, I bought a used one before my first child and have made that work, but it is dying and this one sounds so perfect for a tall momma like me! This is an amazing stroller! Thank you so much for the awesome giveaway and opportunity to win it!! Can you really take this stroller in the sand? Omg! I went to babiesrus yesterday and I was looking at this stroller. I love it!! Would love this easy fold up stroller for my busy one year old! This would be an amazing present for my bestie who is due w/ her first bundle of joy next month! Thank you! I would love to win this amazing stroller! Please pick me! It’s so convenient! Honestly I would just go anywhere to get out of the house! Love the 360 rotating wheels. I’d take it to Disneyland! Love the one handed fold up addition! This will be perfect for baby number two coming November! Thanks for the chance to win! Yay! OMG I’m so completely stoked about this giveaway!! My husband and I are expecting our first in December! What a wonderful Christmas present huh? 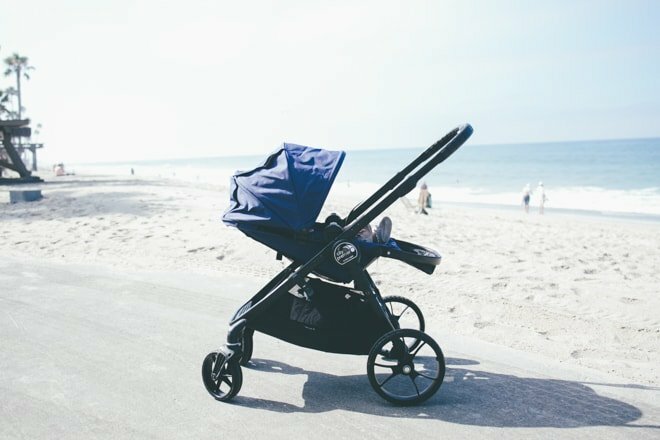 Her name is Lula and we can’t wait to push her all around town in a stroller that is as easy and cool as this one! I would love love this. We are in need of a stroller like this! Seems so easy to use! I love all of your pics, they’re so cute! This stroller would be a dream to win, thanks for the chance! Love the one hand fold! Would love this for all our errands and walks around the neighborhood! This stroller looks amazing! 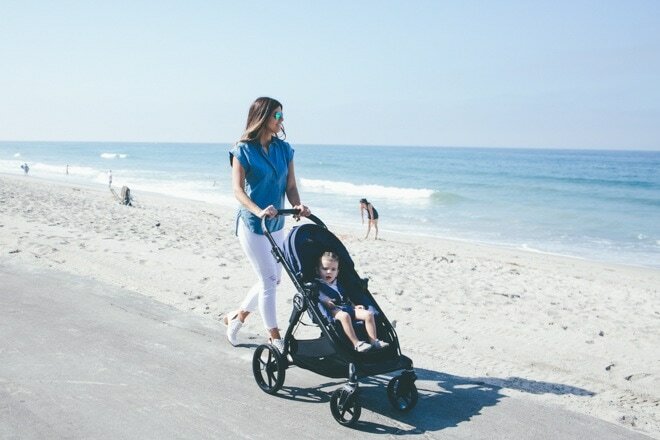 I would love to use this stroller when I take my baby for walks on the boardwalk! This stroller looks amazing! It has all my must have features! Baby Jogger is one of my fav brands! I hate the way the city select folds! This one is so awesome! Would love to win this!!! I love your Blog and this stroller! This would be a lifesaver to have! The one hand fold and a mix of my two favorite strollers in one! Way to go Baby Jogger!! And thanks Mint Arrow! You’re the ?!! This stoller would be awesome to have for my new little guy! Would love this! Fingers crossed. We walk around our town all the time and would take this stroller everywhere! Especially with baby #2 coming soon. Love how easy to fold it is, I need easy with a toddler. I have been eyeing a city select stroller forever! Amazing giveaway. The Lagoon Trail in Farmington, Utah is my go-to walk with my littles, especially in Autumn! This looks sooooo nice! I would love to have this beauty! Such an awesome giveaway! Oh my gosh I NEED this stroller. The stroller is the one thing I wish I would’ve gone better quality on when shopping for baby items, it would be wonderful to have this! Such an amazing giveaway and stroller! Love that it turns into a double stroller too! Perfect for my little girl and rainbow baby on the way! Just realized I was talking about the City Select! ? ? Still would be the perfect stroller when daughter is at school! My britax completely fell apart we used it so much! We are currently in the market for a stroller! We go NOWHERE without an ergo and stroller! Awesome!! Thanks for the chance! I would LOVE to win this stroller!! I have been wanting a good stroller for years!! We started with a graco and we weren’t very happy with it. We have gone through 3 strollers since and none of them hold up. I would LOVe to try this stroller! I didn’t know these two strollers were having a baby! But what a fantastic idea! I would love it! I would love this!! I’m pregnant with my first baby and feel so blessed! This stroller looks amazing!! I have heard it really is the very best! It would be amazing to win this! That one handed fold is the best thing ever! It is so hard to be hard to handle my son and have to take apart the stroller. This would make life so much easier and more adventurous. We would go all around Denver with this stroller. Thanks for hosting such a great giveaway! Fingers crossed I get to stroll my new babe in that sweet thing! I’ve had the same stroller since I had my first baby 4 years ago and it is pretty beat up! Would love this! would love this stroller! my bob is not compact one bit so this would be a nice one to transition to! also, these images are lovely, you are lovely, and those baby girls are just to die for! What a great opportunity. Fingers crossed. We hope to be taking our littles to Disneyland soon. I love love my city select. This looks like the best of both worlds!! Love!! This sounds like the stroller to replace all the crappy strollers cluttering up my garage right now. Just had a baby and she would love cruising around in this new stroller on all our adventures like the zoo, vacations, neighborhood walks. Hope I win! This looks like the perfect stroller! Thanks for the chance to win. What an awesome giveaway! Looking forward to using our new city select when our twins arrive this winter and what better way to start a stroller fleet than by adding the city premier?!?! ? With twins and a baby the one hand fold looks amazing! I love how easily it can fold. I’d take it on all of our airplane trips for sure! Love this giveaway!! This stroller looks amazing!? Please Oh please! I am a momma to a 9 month old and pregnant with our second! I need a stroller so bad and this is perfection! Wow, this sounds amazing! We are trying to get pregnant, so this would be amazing to have once we have our little one! This is awesome! I’ve been going back to all your baby posts as I’m 14 weeks with our first! Keep the advice (and give always!) coming! This looks so amazing and I’m in desperate need of a stroller! I love that it can face backward or forward! I’m such a fan of Baby Jogger! I’ve been using the same City mini for 6 years, but the tires are almost bald. I may need an upgrade for #4 coming this fall! Love Baby Jogger! We’re headed to WDW this October – this stroller would be a perfect addition to our travel plan! Thanks for the opportunity! Love this stroller!!! It looks amazing!! Also love your blog!! Love your blog!!! It’s seriously a daily must read!! This is amazing! What a great giveaway!! I loved my Baby Jogger Micro! I flew a lot with my son by myself and having that stroller saved me! Now with the second on the way we are on a very tight budget but are in major need of a bigger stroller! Would LOvE to win this beauty!! Would so love to give this stroller a shot! This stroller is amazing! After 4 babies in the same stroller baby #5 needs a new one! We would be so greatful to win this stroller! Love that this stroller rear faces. Would be perfect for baby girl once my post partum restrictions are off in a couple weeks! OMG! I would love this! I love that you can fold it down with one hand. So amazing! Love love love your outfit, hope I win the stroller!!!!! This would be AMAZING for baby coming in December. Thank you! That looks amazing! Better than any umbrella stroller I have ever seen! Would LOVE this stroller! Love that it’s smaller than the City Select, even though I absolutely love that stroller! We would definitely take this to Disneyland next month!!! This is an amazing giveaway! I love the generosity you show to your readers. You’re too good to us! Love!! I would love to win this beautiful stroller. So amazing it closes with one hand. Oh my gosh, as a foster mama I have been dreaming of the day I can push a babe in a great stroller and it looks like I will soon have someone in my home long term! Any day now! This stroller looks amazing, I love the adjustable handlebar height for tall parents! I would absolutely love to get this stroller! We are doing ivf and it would be great to get help getting good baby gear! That looks amazing! Would love to win this!! Need this for my new baby girl coming in October! I would absolutely be thrilled to own this!!! Pregnant with my 5th and due in two months! It would be the biggest gift to myself ever!!! Such an awesome giveaway! I would take my son to the beach before fall arrives. What an amazing giveaway! Would love to win! this looks amazing and like i need it!! I LOVE THIS!!! THANK YOU FOR THE OPPORTUNITY! Awe this is amazing! Would absolutely die to have one of these! I have a baby the same age as your sweet baby! You have the best taste so I know this stroller will be amazing! This stroller looks perfect! The best combination of comfort and ease, my baby would be riding in style! Ok I would love to win this. Does it give you the option to be a double stroller, too? Love the look and the stroller! I would love to win this amazing stroller!! What a wonderful giveaway! I have a two month old and a two year old and a new one handed close stroller would be so helpful getting around with my busy toddler! I would love to win this stroller for my family! We would love to take on trips, especially Disneyland! Amazing Stroller! Would love to win for my daughter and her two boys! This is the exact kind of stroller I’d love to have for my new son! I need this so bad for little one coming! Love how compact, the folding, style, and baby can face you. I definitely could never buy on my own! Good luck to everyone! I’d love to get one for our coming baby in Dec 2016! I love the easy fold up and I would definitely take it back to Europe with us! Love your blog and always look forward to your baby deals. Would love to be blessed with this. We are expecting our first little one in November and still haven’t got a stroller or car seat. We are constantly on the go so having something as functional as the city premier would be a wish come true!! I love the City Select, and would love to win this new stroller! Please also let us know if there is ever a sale. So excited! Beautifully designed stroller. Love the easy fold up!! I would take a walk down by the beach or go to Disneyland! I absolutely need this one-hand-easy-fold stroller!!!! Looks incredible! I love when two products combine to become a mind-blowing life- and game-changer. This is a must for mommies! This giveaway is a DREAM! I would love to take my baby on the way any and everwhere is this amazing stroller! ? I can’t even handle how awesome this stroller is, I’m ????. Dying to try this! It is perfect! Would live to win! I was just telling someone to follow you earlier today!! Please let me win for my sister. Love this giveaway ! Would be so nice. Yay!!! Awesome!! Love me some strollers!! I’m a city select girl!!! I’ve had my eye on this stroller!!! ??? You are seriously the best ever!! Helllooooo fabulous giveaway? You are inspiring me in every way! Such a great giveaway! The new City Premiere looks like a dream! I’m currently pregnant and would love to try this stroller! Looks like such a sleek and modern stroller, we’d love it! Our citi mini is on its last leg with a new baby on the way…this would be an amazing win! This would be so awesome!! Crossing fingers! Does this stroller have 2 seat capability? I would love to win this amazing stroller! I would take my son everywhere in it! Thanks! Oh my goodness, this stroller is a dream. I’m pregnant with my first (and so excited) and have been debating between the two baby jogger strollers. I had no ideas they made this one! I’m sold! The one hand fold capability would be a LIFESAVER!! My son and I love going on walks! This would make it easier to maneuver the 3 flights of stairs up and down from our house. The best posts… Now the best giveaway! Thank you ???? Perfect stroller for my new grandson!! This is seriously the best of both worlds! I’ve been looking at both strollers for months not being able to decide. This giveaway is amazing! This is such an awesome giveaway, crossing fingers and toes! Thank you! It looks like the cadillac of strollers, from the suspension to the adjustable handlebars. It would make a perfect gift for a special friend who just found out she is expecting after trying for years. She would be ecstatic! This would be the best thing ever for us! This stroller has me drooling! We go on lots of long walks, trips to the zoo, botanical gardens, etc. The big old bulky stroller I have takes a little of the fun out of it. I would love the convenience and stability of the City Premier! This would be amazing for me to have! Looks so awesome!! Love Baby Jogger! This stroller looks A-M-A-Z-I-N-G! This stroller is To Die For! I love it! I would love to win this for my little babe! I’ve been swooning over city select and this one looks amazing! It would make going anywhere so much easier with a busy 1 1/2 year old. Thank you for the opportunity! So excited about the easy fold!! Love the city select so the Premier would be amazing! Love this blog! Good to hear honest opinions about this stroller…. After reading this I want it even more! Love the outfit too!! My sister has one and is obsessed!! Looks amazing! Awesome giveaway! I’ve always wanted a baby jogger! Oh my gosh! I want to win this for my sister!!!!! She’s due in 10 weeks! It’s like they’ve finally read my mind! Looks like an amazing stroller! I would love to give it to my sister who is just adopting her first! Love this stroller. Would be a neat and well loved prize. I love the reclinability of the seat (is that a word??) and the fact that you can flip the handle! Such an awesome giveaway! How kind and generous. This is an amazing stroller.